With the release of Google Play services 7.8 we’re excited to announce that we’ve added new Mobile Vision APIs which provides the Barcode Scanner API to read and decode a myriad of different barcode types quickly, easily and locally. Classes for detecting and parsing bar codes are available in the com.google.android.gms.vision.barcode namespace. The BarcodeDetector class is the main workhorse -- processing Frame objects to return a SparseArray<Barcode> types. The Barcode type represents a single recognized barcode and its value. 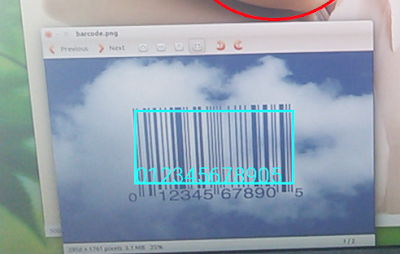 In the case of 1D barcode such as UPC codes, this will simply be the number that is encoded in the barcode. This is available in the rawValue property, with the detected encoding type set in the format field. For 2D barcodes that contain structured data, such as QR codes, the valueFormat field is set to the detected value type, and the corresponding data field is set. So, for example, if the URL type is detected, the constant URL will be loaded into the valueFormat, and the URL property will contain the desired value. Beyond URLs, there are lots of different data types that the QR code can support -- check them out in the documentation here. When using the API, you can read barcodes in any orientation. They don’t always need to be straight on, and oriented upwards! Importantly, all barcode parsing is done locally, making it really fast, and in some cases, such as PDF-417, all the information you need might be contained within the barcode itself, so you don’t need any further lookups. You can learn more about using the API by checking out the sample on GitHub. This uses the Mobile Vision APIs along with a Camera preview to detect both faces and barcodes in the same image. The API supports both 1D and 2D bar codes, in a number of sub formats.